Friday night always used to be about going out, however now that we are older and parents, we often no longer have either the energy or the availability of childminders to go out on a Friday night. However, earlier this year we were invited to review one of Newcastle’s newest restaurants, Chaophraya. I asked if we could wait a few weeks until we had babysitters, of course, this was no problem, and it also turned our date night into a Valentines evening too. 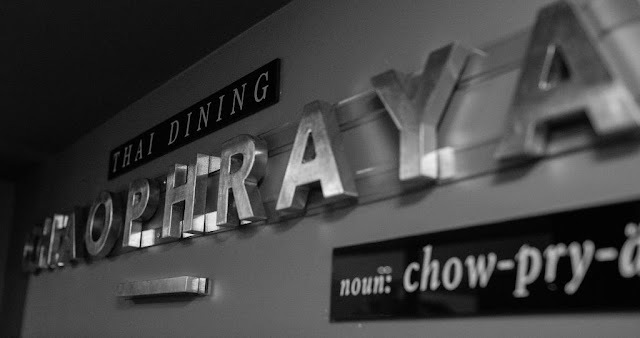 Chaophraya Newcastle is part of a restaurant group with eight sites across the UK, although each of them is unique in design. 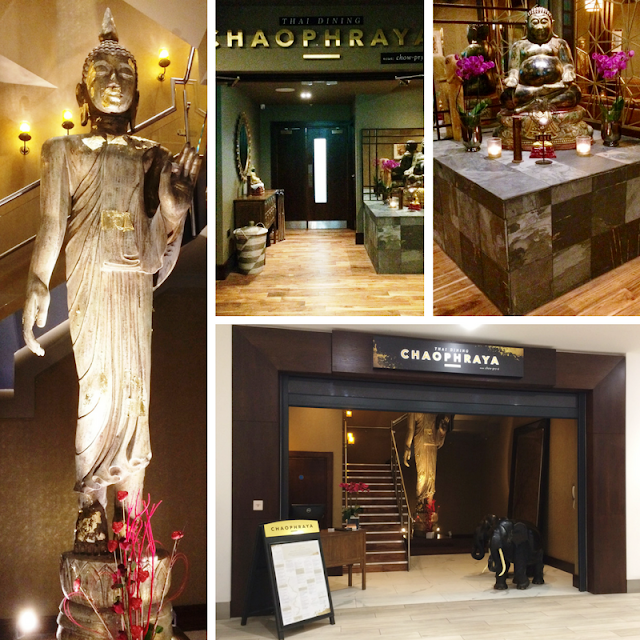 Owned by the UK’s fastest growing group of authentic, award-winning Thai restaurants, Thai Leisure Group opened its flagship restaurant, Chaophraya, in Newcastle city centre just before Christmas. The Thai Leisure Group of restaurants and bars is owned jointly by Kim Kaewkraikhot and Martin Stead. Previously, Kim was a chef and she ran her own small restaurant in Bangkok. 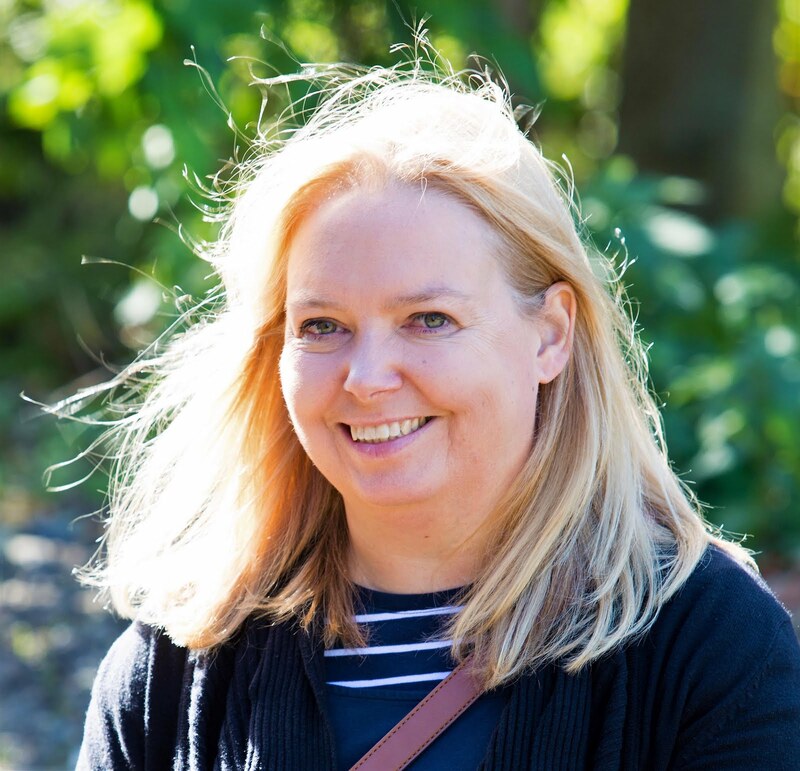 Located in the new Grey’s Quarter of intu Eldon square, it is not a chain that I have been to before, however, I do love Thai food, our holiday in Thailand a few years ago was one of the best we’ve had, so I was really looking forward to our evening. 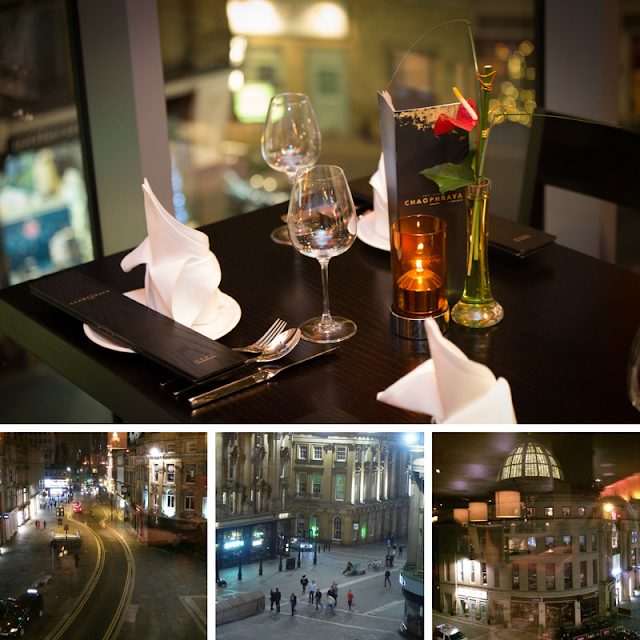 As you walk up Grey Street it is hard not to miss Chaophraya as it overlooks Grey’s Monument. Occupying part of the top floor of the new food quarter it is accessed by a lift straight from the ground floor or via its own staircase or again the lift from the first floor. On arrival, we were met and offered a seat in the bar, however, even though we were slightly early our table was ready so we ordered drinks from our table, where Thai Prawn Crackers, sweet chilli dip and water were waiting for us. And what a table it was. 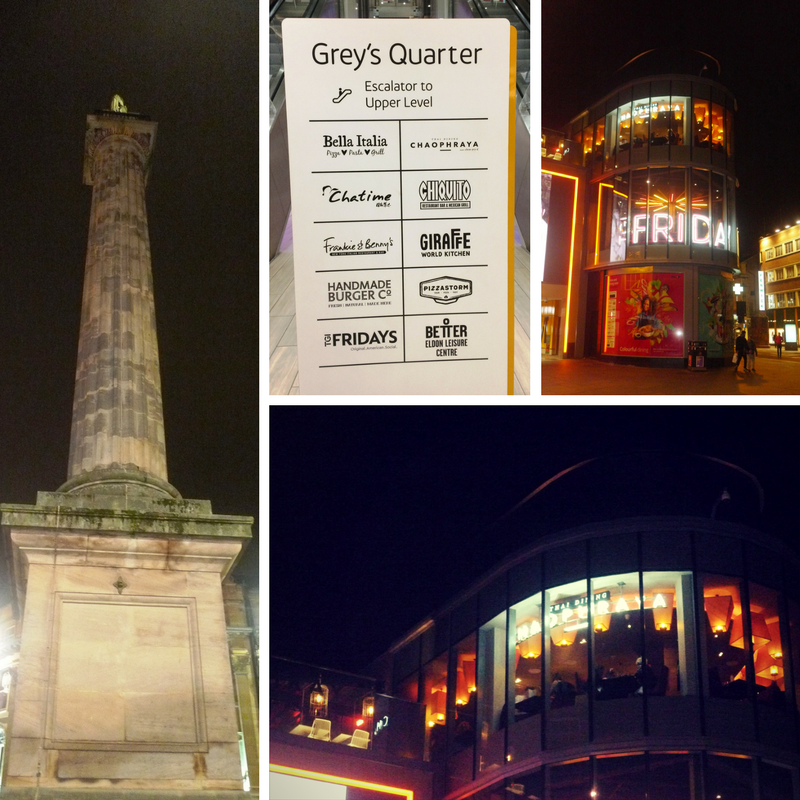 We were sat in the window overlooking Grey’s Monument, Blackett Street and Grey Street with an amazing view of the comings and goings of a Friday night in Newcastle. I don’t think I’ve ever seen so many taxis or delivery bikes before, and even Mr Blobby walked by as part of a stag do. It was a fascinating and entertaining view. But back to the drinks. After deliberating over cocktails or wine we plumped for a Thai Rose wine called Monsoon Valley (£23 per bottle). This is a wine blended from Thai and international grape varieties grown at the Floating Vineyards of Samut Sakorn and Hua Hin Hills Vineyard. I don’t think I’ve had a Thai wine before, but this one was delicious and I’d be happy to order it again. Now for the food. There are set menus but we decided to order from the A la Carte menu. Starters range from £6.50 to £12.50 per person and include Spring Rolls, Soups, Tacos, Fish Cakes and Tempura and much more. Many of the dishes sounded so delicious that we chose a Vegetarian Sharing Platter, so we get to try out a few of them at once. The Vegetarian Platter at £8.50 per person was a generous combination of sweet corn cake, spring rolls, vegetable tempura and Thai vegetable Tacos. All cooked to perfection there was certainly enough food for more than two people but we happily ate it all up. And so on to the mains. Hubby chose the Tofu Pad Thai Noodle, as we were both keen to try it after I’d read good reports of it on Twitter, and also keen to compare to other Veggie Pad Thai dishes we have eaten in other places. The dish of stir-fried Thai rice noodles in tamarind sauce with tofu, spring onions, carrots, sweet turnip and bean sprouts, topped with pickled vegetables, didn’t disappoint. The presentation was lovely, and with its great texture, colour and taste it was a delicious and filling dish and at only £9 was certainly not overpriced. After starting to eat fish last year, I have a new found love for Sea Bass. I’ve eaten it at a few times in restaurants and this particular dish of Pla Ga Pong Neung Manao Steamed sea bass fillets with coriander root, lemongrass, galangal, lime leaves, served with fresh chilli and lime sauce and a salad of yellow soy beans, sugar snap peas, choisum and chillies, caught my eye. At £17.50 it is not a cheap dish but comparable with other restaurants and the dish itself was amazing. From the presentation of the flavoursome fillets, skewered with the lemon grass, to the sauce with a fiery kick to it, the whole dish was delicious and I certainly did not wish I’d ordered an alternative. All in all, although the accompanying Jasmine Rice was perfect it actually wasn’t essential, and this dish could easily be eaten on its own, making it a lighter main course too. Now to the dessert. All the desserts have a contemporary twist. At a nearby table, I had seen a dessert that melts in front of you. It took me no time at all to find this one on the menu. Hubby went for the White Chocolate Box, a white chocolate mousse with raspberry coulis on butter shortbread served with a mini macaroon and passion fruit syrup. He says this is the best dessert he has ever had. High praise indeed. My melting Chocolate Bombe comes with Thai whiskey ice-cream, honey and toasted sesame popcorn centre with hot caramel sauce poured over the chocolate to make it melt in front of your eyes. Both were priced at £7.50 and we each loved the choice we had made. 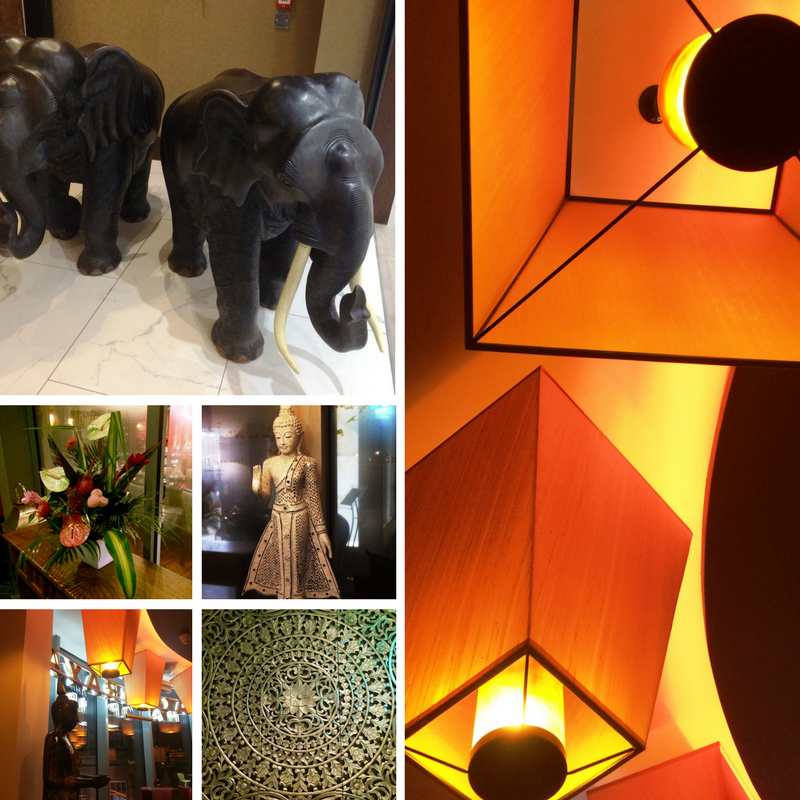 The restaurant offers contemporary Thai cuisine in beautiful Thai surroundings and a relaxed environment. Being on the 2nd floor looking down on the busy city centre, Hubby said it reminded him of New York dining. The staff were friendly and attentive, even charming some boisterous diners at a nearby table with great ease. The courses were not rushed giving us time to digest our food, but I also didn’t feel like we had been waiting for ages for our dishes to appear either. With fresh and flavoursome food it brought back really good memories of our hotel restaurant in Phuket too. We had a lovely night out and all in all, we were in the restaurant about two and half hours. This is a restaurant that I would have no hesitation in returning to, especially for a special occasion, and would love to go back for another date night or with friends too. You’ll find Chaophraya at 15 Upper Level, Greys Quarter, Intu Eldon Square, Newcastle Upon Tyne. As well as the A La Carte menu there are set menus for a minimum of 2 people (including a Vegetarian option) starting at £28 per person, and between 12 – 4 pm, Sunday – Friday the lunch menu offers a starter and one main course for £14.50. Private dining is also available. On the way out we took a peek at the outside balcony and we both agreed that would make a great place for a date night on a summers evening. We had been invited to review our experience in return for a complimentary meal for two. However at the end of the meal one of our waiters brought us the bill – this wasn't a problem at all but it was really good to know the service hadn’t been amazing just because we were doing a review! 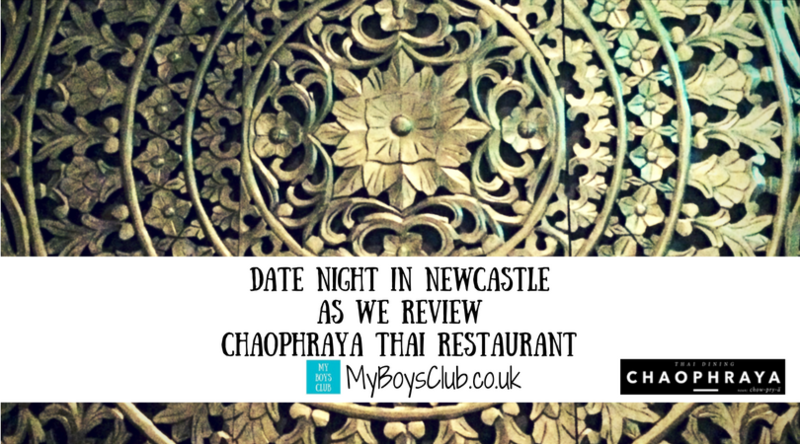 We loved it here and it is now top of our date night list for Newcastle! I always go for the Thai Red curry! I try to be different and think seriously about ordering fish like you did but eating out as parents is such a rare thing these days, I always end up ordering my favourite! That food looks delicious, especially the puddings! Oh wow!! This looks delicious, the food has made me hungry hahah.